NOTE: This is a guest post from author Auston Habershaw. Dead but Once, book 3 of his Saga of the Redeemed series, is on sale now. Enjoy! Sweet Jesus, what was I thinking? I think most writers who dive into the fantasy genre want to write multiple books in the same world. A lot of this is Tolkien’s fault, since he was so formative for so many of us and it’s taken the better part of a century for us to begin to escape from his shadow (emphasis on begin). The fantasy genre is awash in series-long epics, all of them taking their merry (or grim) band of heroes through their paces until, at long last, they stand on the threshold of their own little version of Mount Doom and see if, after all they’ve been through, they can do what has been asked of them. Sometimes they succeed, sometimes they fail, sometimes they find out they’ve been right all along, and sometimes they discover, to their horror, that they are part of the problem. Whatever the outcome, however, we all just assume that this is what fantasy is. What we authors don’t realize sometimes is what it takes to make a series work. It’s hard, friends. Sometimes insanely so. It’s full of perils and pitfalls and mountains of madness. As our characters go through their multi-volume ordeals, so do we. When I first conceived of the Saga of the Redeemed, I wanted to write fantasy heists starring Tyvian and Artus for the rest of time. I plotted out something like eight or nine books (! ), taking Tyvian all over the world as he gradually became a better and better person. I had intricate world-building set up for dozens of nations and cities, I had historical timelines crossing thousands of years, I had plots and secret societies five deep and six wide. Had my first book been a breakout hit, I probably would have written all those books, but here comes the first thing you learn as a fantasy author: a series is not guaranteed. A publisher isn’t going to sign on for a million sequels every time. In fact, getting another three books (as I did) meant I was doing pretty well, and I feel very fortunate to both Harper Voyager and to my agent that I was afforded the opportunity to finish out my series in a satisfying way. Looking back now, my nine book outline seems ridiculous—arrogant, even. Breaking things is a requirement of a novel series. Like the kid who builds the intricate sandcastle on the beach for the express purpose of watching the ocean knock it down, we fantasy authors build intricate worlds full of complex societies and then, over the course of our books, find ourselves in the position of breaking apart the things we built. This kind of managed destruction touches every aspect of the books, from the main protagonist to the side characters to even the geography, in some cases. It you want an interesting story, you can’t have a static world. But a dynamic, changing world full of dynamic, changing characters is a difficult thing to manage. In the first book, you get into a groove—this is the world Tyvian lives in, these are his problems, this is how he will solve these problems. By the second book, you have a different world and a different Tyvian and different problems and also need to solve these problems in a different way. There are even more characters to deal with, too—more sets of problems, more views on this (now different) world. Then, in the third book, you’ve got an even more different world with different characters and different problems and different solutions. As the cast expands and the world shifts, all that original world-building needs constant re-evaluation and re-editing (well, if the economy of Saldor crashes in book 2, then how does that affect the economy of Eretheria in book 3?). You soon feel like the plate-spinner on the old Ed Sullivan show (google it, kids)—running back and forth, trying to keep everything clear and sensible while also trying to keep the plot moving. And then comes the extra rub: You can’t change it too much, either. Yeah, the audience doesn’t want the same thing, but they also don’t want a totally different thing (remember the backlash to The Last Jedi? Yeah, that). So, while you’re in the middle of breaking everything, you also need to make sure you don’t break the really important things that the audience loves. But what is that, exactly? You, the author, are perhaps the least well-equipped to know, because the book you write is never quite the book other people read. So there you are, plate-spinning a half dozen new characters and a half-dozen old ones while also making sure everything that happened in the first and second novels are reflected in the third in a realistic and believable way and then introducing new elements into the world to make it interesting all while making sure to not tell a story that is too different than the last one, lest everyone lose interest. See how we fantasy authors have left the path of wisdom? 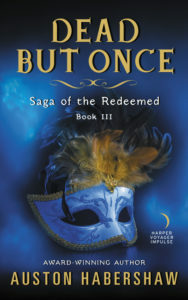 So, after all that—after the explosive conclusion and the denouement that followed the conclusion of my fourth and final book in The Saga of the Redeemed—I felt fulfilled but also weary. A bit like Tyvian, actually, and maybe a bit like Frodo. Hmmm…come to think of it, maybe all fantasy authors are, on some level, reflected in their main characters after their labors are completed. They’ve gone out there, changed the world, destroyed the One Ring, and now they need a vacation. They want to settle down with Rosie in the Shire and just work in the garden for a while. But, of course, we authors aren’t quite like Samwise Gamgee, are we? We’re not even a bunch of Frodos. We’re wizards, dammit. Like Saruman the White, we’re going to pull on our white robes again and start making magic in a whole new world, unwise though it may be. Dead But Once is available now in paperback and ebook. Don’t miss The Oldest Trick and No Good Deed, both on sale now! For more info on Austin Habershaw visit his website and follow him on Twitter.